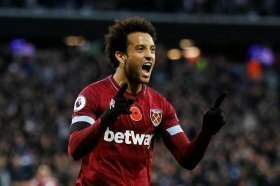 West Ham United are understood to have no plans of selling Felipe Anderson in the summer amid the high-profile interest from Real Madrid. The east London outfit pursued the Brazilian from Lazio for a club-record fee last year, and he has since been impressive with a tally of nine goals and four assists across all competitions. A recent report from Sky Sports News suggested that Los Blancos may consider making a move for the 25-year-old, should they fail in their attempt to lure Eden Hazard from Chelsea. However, the same publication has now revealed that Hammers co-owner David Sullivan won't entertain any bids for the playmaker, who remains integral to their plans for next season and beyond. Anderson has witnessed a significant dip in form during the backend of the campaign, but that has not reduced his importance with him being almost ever-present under Manuel Pellegrini. The attacker is expected to feature for the Hammers when they face Manchester United on the road this weekend. He scored his maiden league goal in the reverse fixture.